Exterior lighting illuminates the home's architectural features and adds beauty, curb appeal and safety to a home. Properly installed exterior lighting can reduce accidents, create a warm welcome to guests and deter unwanted guests. Poorly placed exterior lights can create unsafe glares and unhappy neighbors. Appropriate height, style and size should all be considered before installation. Lights around the exterior doors should be mounted at approximately one-third of the way down from the top of the door's height. Sometimes there are two exterior lights around the door, in which case the light fixtures should be about one-quarter of the door's height down from the top of the door. If only one light fixture may be hung due to architectural limitations, hang it on the same side as the doorknob. For example, if a door is 9 feet tall, the light fixture(s) should be hung about six to seven feet above the ground. Safety lights, such as motion-sensing security lights, should be mounted inside the corner of the fascia board. Garage door light fixtures light the way into the garage. Depending on the garage door, one lantern in the middle or a lantern on each side of the garage door should be installed. Use the same rule as for exterior lights near doors: hang the lights on the sides of garage doors about one-quarter of the way down from the top. 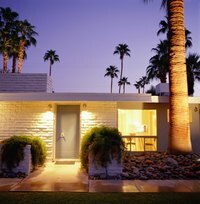 Back door lighting is also recommended for safety; use the same approach as front door lighting. Landscape lights are used to light walkways or light sculptures or other yard focus areas, such as trees or fountains. These lights are battery or solar powered in most cases. Most are designed to be placed right into the dirt lining the walkway. Some are placed around decks and on outdoor stairways. Another idea is to use post lanterns to light the driveway or parking area in case exterior door fixtures don’t reach that distance. Post lanterns can also be used to outline the perimeter of a deck or patio. Energy-saving fluorescent bulbs are efficient and good for both the environment and your pocketbook. They reduce energy bills and last longer than regular bulbs. When installing outdoor lighting, consider any "dark sky" ordinances or similar laws in your area that control sky light pollution. They typically mandate a specific time when certain lights need to be off. Outdoor lights should not be pointed directly at the street or driveways to keep light glare from impairing or distracting drivers. Homeowner and municipal regulations should always be considered before installing exterior lighting.